Solomon Power is managing a grant-financing project from the Global Partnership on Output-Based Aid (GPOBA) adminstered by the World Bank for an Output-Based Aid (OBA) program. This program is designed to help low income households pay for the on-off upfront initial connection fee to access grid electricity. The Output-Based Aid (OBA) program aims to energise a total of 2,565 households in the Solomon Islands. The Solomon Islands Electricity Authority (SIEA) trading as Solomon Power (SP) is a State Owned Enterprise (SOE) constituted under the Solomon Islands Electricity Act of 1969. They are responsible for the generation, transmission, distribution and retail of electricity. This body also has the responsibility for providing electricity efficiently and profitably throughout the Solomon Islands. Low income households tend not to connect to the power grid because of the high up-front costs, being left with no access to income-producing benefits and improved welfare from grid electrification. Residents tend to spend more on expensive and low quality electricity supply, such as car batteries or small solar home systems. The OBA Program is designed to provide one-off subsidies to eligible low-income households to cover a portion of the upfront cost of electricity service connections in the Honiara grid (existing service area and planned expansion areas), and in the outstations. The OBA subsidy covers materials and installation of the service line and auxiliary pole, when needed; and in-house wiring including protection, earthing, and two LED light bulbs in accordance with the AS/NZS Wiring Rules 3000 and Solomon Islands Electricity Act & Regulations. Solomon Power continues their tendering process to purchase House Wiring Materials from respectable suppliers for this OBA Project globally. The supply of the electrical enclosures was done in two stages with the first stage of supply consisting of 200 units of Temporary Power enclosures TB1212/U. A second order was placed with B&R for the Temporary Power TB1212/U that were fully wired with switchgear, GPO’s and lights supplied within the enclosure. This ensured ease of managing the rollout with the installing contractors and were custom built to suit their needs. B&R used extensive experience through their value add services team to manage the wiring and fitout of the enclosure. This ensured strong and consistent connections with switchgear and accessories suppliers in Australia to provide a complete package offer. B&R hosted Solomon Island’s Electrical Authoirty Regulatory Manager, Mr Kitione Maluguleva in late 2016. 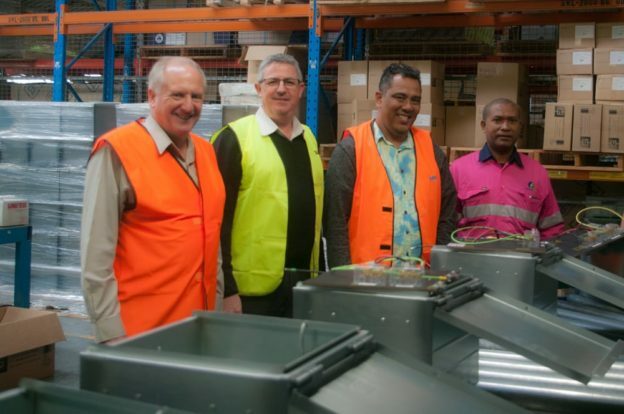 Mr Maluguleva visited to tour the facilities in Heathwood, Brisbane. His visit included discussion on how B&R could assist with providing a turnkey offer ensuring ease of supply and installation. B&R Enclosures is Australia’s largest enclosure manufacturer. We supply products and services to our customers who provide the technological and electrical backbone of our country and power our ever increasing demand for data and technology as well as some of the basics of life like heating and lights. Since 1955, B&R has built a reputation for excellence in the design and manufacture of enclosures. For more information, visit B&R Enclosures or for more information about our company see our company pages. This project is tagged and filed under Projects, Residential Commercial.